A dedicated nurse clinical care coordinator helps each patient take full advantage of all therapies and treatment options available. The Southeast’s first comprehensive cancer treatment program at the University of Alabama at Birmingham takes patient care to the next level by improving the lives of women affected by or at risk for ovarian cancer. UAB Comprehensive Ovarian Cancer Program combines traditional cancer interventions with wellness programs to enhance the overall care of patients and caregivers through each step of treatment. The program includes patient and caregiver support services, oncology rehabilitation, mind/body medicine, naturopathic therapy, fertility preservation and more. “We created an all-encompassing program to provide personalized care for women diagnosed with ovarian cancer or in remission, or at risk for ovarian cancer,” said Warner Huh, M.D., director of the UAB Division of Gynecology Oncology. Through the UAB Comprehensive Ovarian Cancer Program, each ovarian cancer patient is designated a clinical care coordinator to guide them through treatment and utilize all aspects of the program. Depending on the specifics of each patient’s case, conventional treatment could include surgery, chemotherapy, targeted therapies, radiation therapy, hormonal therapy, genomic testing and precision medicine, and/or participation in clinical studies of new treatments. Diet is an important aspect of cancer care, especially when a patient is recently diagnosed and in the beginning of treatment. Each patient visits with a registered dietician prior to starting treatment to identify goals for caloric and protein needs to prevent malnutrition, restore digestive health and optimize the treatment regimen. Patients and caregivers have the opportunity to attend classes on healthy eating habits. UAB’s oncology rehabilitation specialists help patients maintain strength and mental aptitude through physical and occupational therapy. 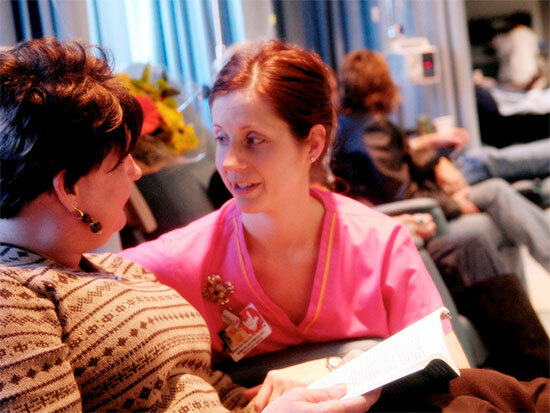 Supplemental patient support services through the UAB Comprehensive Ovarian Cancer Program include support groups, financial counseling, medication assistance, hospice and palliative care, caregiver support resources, woman-to-woman mentoring, and access to online education like podcasts containing up-to-date information about cancer-related issues. Patients meet with a licensed counselor at least once during their treatment to identify services that improve mental health, minimize stress, and improve relationships and overall well-being. Services available include pet therapy, UAB’s Arts in Medicine program, relaxation and guided imagery, patient and caregiver support groups, counseling services and pastoral care. The UAB Comprehensive Ovarian Cancer Program has partnered with UAB Integrative Medicine to provide patients with programs designed to address the physical, biological, lifestyle, emotional, psychological and spiritual aspects of health and illness. The combination of the two programs focuses on the whole person, including family members, to optimize wellness and manage the challenges throughout each patient’s cancer care journey, from prevention to survivorship and beyond. Comprehensive risk assessments and prevention strategies for ovarian, breast and uterine cancer are offered through the UAB Lynne Cohen Preventive Care Program for Women's Cancer, arming women with knowledge to make informed decisions about their future risk and care options. For women with an elevated risk for ovarian cancer, the program offers “pre-survivorship” care that provides the education and medical knowledge patients need to make informed decisions about ovarian health. This program increases the likelihood of early detection and offers clinical solutions that may reduce the chances of being diagnosed with ovarian cancer in the future. Survivorship care is for women whose cancer is now in remission, providing ongoing medical and emotional support needed to remain healthy, long after treatment has come to an end. From 2010 to 2016, UAB treated more than 2,880 patients with ovarian cancer and have enrolled around 350 patients in clinical trials. Patients have access to the most advanced cancer treatments and research available through the UAB Comprehensive Cancer Center. UAB is renowned for ovarian cancer care, receiving one of five Specialized Program of Research Excellence awards in ovarian cancer from the National Institutes of Health.